Habits, traditions, rituals and even memories are often associated with food. I’ve really been thinking about how much of what we eat is connected with what we do. We create rituals associated with food. Some good, some not so good. I inadvertently developed a bad food habit with my kids. We have bible study in town one night a week. It’s a late night and we get home after their normal bedtime. On our way home it’s become our habit to drive through Taco Bell. Lil’ Z always orders two cheese roll ups and Big Z usually goes for a potato soft taco, and I always order the 7 layer burrito. We bring it home and watch a recorded episode of “Chopped”. Well, I guess I didn’t think about it too much before starting this 10 Day Challenge. I justified that we ate healthy most of the other time and this was a treat. But this week I had to be creative when bible study night came around. I drove a different way home so we didn’t pass Taco Bell. I also made a big deal about making homemade ice cream and pointed to that as our special treat when we came home. The kids didn’t mention Taco Bell though I was sweating it. I was glad to hear that I wasn’t the only parent that has set up some food rituals that I needed to skirt around this week. Simply Natural Mom wrote an article about her creativity in arranging dinner at ‘mom’s restaurant’. Kids love it when we make special food for them and give it some thought. One goal I have after finishing the 10 Day Real Food Challenge is that I hope from here on out to divert their attention from Taco Bell and make a healthier food habit. It’s eye-opening to realize how much of our traditions and forms of entertainment are associated with food. I was working on this post when I noticed Gabe wrote about her family tradition of rolling cabbage rolls for Easter. Food has a way of making memories. I love when we visit my husband’s family in Portugal that an entire day can be spent leisurely eating one scrumptious dish after another. You only need to take small breaks to fill up your glass of port. This week we had to distract the kids from the free cookie at the grocery store bakery and lead them to the free balloon instead. I also had to give up my habit of a piece of dark chocolate after dinner. We have a ritual each evening of having a cup of tea together as a family. We usually have it with a cookie or sweet treat of some kind. So we’ve made adjustments there as well. I don’t think I realized how much sweets were a part of our routine. This is been a positive time for a change in that area. Breakfast-I made a giant omelet. Half of it was filled with cheese for the boys, and the girls had veggies including spinach, peppers, and onions. Lunch- We were on the run. I packed a lunch of raw veggies (cucumbers, yellow peppers, carrots) with hard boiled egg with a side of Ranch Style dip*. I made Moroccan Sweet Potato salad from the Simple Food cookbook.The kids also had string cheese. Dinner-Vegetable fried rice with Miso soup. I started making it then I realized my soy sauce had sugar in it. Wha! I had spent so much time researching my soy sauce after switching from using Bragg’s liquid amino. I was disappointed it had sugar, boo! So I had to get creative and season my rice a little differently than normal, but it turned out pretty good. I used Thyme, Cayenne, lots of black pepper and miso stock. 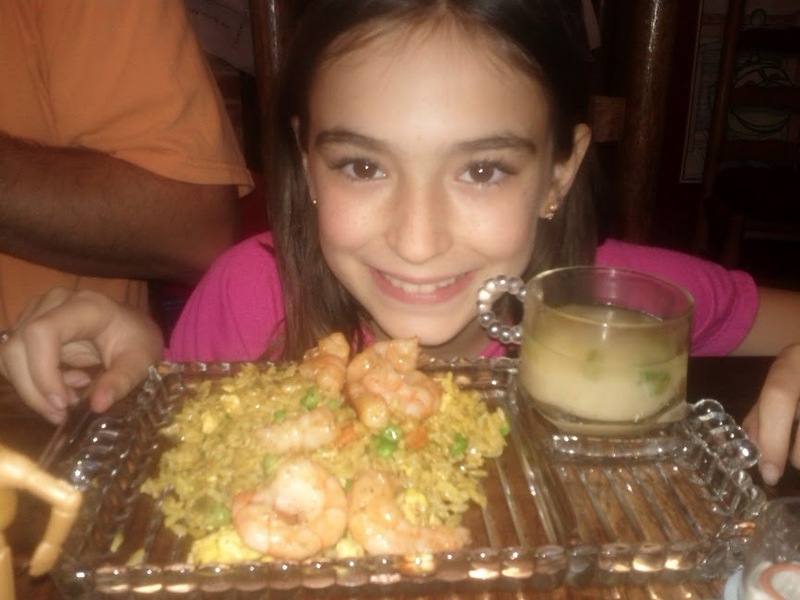 The kids had shrimp with their rice. Breakfast- We had to be out the door early this morning. Cereal ( shredded wheat) with honey, eggs, and bananas. Lunch- Leftover Kidney Bean soup. Sprouted Corn tortilla quesadillas. Dinner-Green Lentil Curry Coconut soup* with ‘Garden Fish’. It was so delicious! I’ll share the Garden Fish recipe Monday. I also baked two loaves of Honey Whole Wheat bread* that we enjoyed with the soup. Snacks- I made chocolate mousse ( cold cream from coconut milk whipped with vanilla, cocoa powder and a little maple syrup) as a special dessert tonight with our evening tea. * recipes can be found on my Pinterest board for the 10 Day Real Food Challenge.